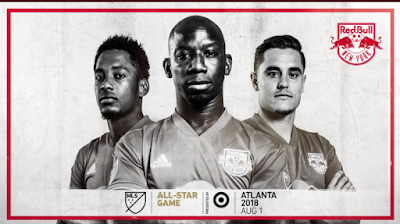 Wright-Phillips, playing in his second MLS All-Star Game, is a Commissioner's selection. Long and Murillo earn their first All-Star selections as coach's picks by Atlanta United FC coach Tata Martino. The Red Bulls have the second-most All-Stars of any MLS team, behind only the hosts, Atlanta United FC. No other MLS team has more than two representatives for the match against Juve. The Red Bulls boast multiple All-Star selections for the first time since 2014 when Wright-Philips was joined by Thierry Henry and Tim Cahill to face FC Bayern Munich. Wright-Phillips tallied his first career All-Star goal in the 51st minute to help the MLS All-Stars defeat Bayern, 2-1, at Providence Park in Portland, Oregon. Wright-Phillips, a two-time MLS Golden Boot Winner, is having a stellar start to his 2018 campaign, tallying a team-high 11 league goals and five assists in 15 matches. His 11 league goals are just three shy of Atlanta's Josef Martinez for the Golden Boot lead. Wright-Phillips' goal and assist production has been unmatched up to this point, owning a 1.37 goals-plus-assists per 90 minutes this season, which is the top mark in the league for players with at least 750 minutes played and no penalty kick goals. Long, 25, has been a mainstay at center back since earning promotion to the First Team prior to the start of 2016. Long has made 15 appearances this season and logged the most minutes of any field player, playing 1,203 of the possible 1,350 minutes. Murillo, 22, was permanently transferred ahead of the 2018 MLS season after joining New York on loan from San Francisco FC in 2017. The defender is set to return to the Red Bulls after playing in the 2018 FIFA World Cup with Panama, where he faced off against some of the biggest names in world football. On the offensive end, Long (2G) and Murillo (1G, 2A) have combined for three goals and two assists, part of an offensive effort that has seen New York record 15 different goal scorers across all competitions. Juventus, the defending Serie A Champions, is the most decorated club in Italy, winning more Serie A and Coppa Italia titles than any other Italian club. Juventus also reached the UEFA Champions League final in two of the past four years (2015, 2017). The team is managed by Massimiliano Allegri, who just completed his fourth season with the club. Kickoff for the 2018 MLS All-Star Game presented by Target on August 1 is set for 7:30 p.m. ET with coverage on ESPN, UniMas, TSN and TVA Sports. Tickets to the game are now on sale by visiting Ticketmaster.com. Tickets start as low as $35.